ios9: Bug in Apple's new mobile operating system won't let people install it. 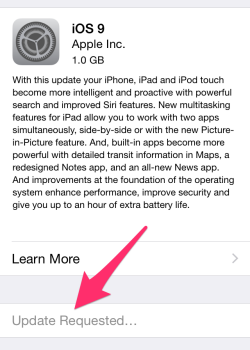 Many iPhone users are reporting an error message when they try to download iOS 9. The release of Apple’s new mobile operating system has become a major annual event for the company’s loyal iPhone and iPad users, who waited anxiously Wednesday for the clock to strike 1 p.m. ET so they could download iOS 9. A lot of them were in for a disappointment. It’s an embarrassing snafu for Apple, which prides itself on technology that “just works.” Whether it will set back the company’s efforts to get users to quickly upgrade to the new OS will depend on how widespread the bug is and how long it lasts. I’ve reached out to Apple for comment and will update if the company replies. To make matters worse, the iOS 9 download glitch comes on the heels of Apple’s admission earlier Wednesday that it will delay the release of its new Apple Watch operating system, WatchOS 2, due to “a bug … that is taking a bit longer to fix than we expected,” as a company spokesperson told TechCrunch. That release was also expected to be available today. As any IT professional will tell you, bugs are inevitable in any software development project of significant complexity. That said, you’d think the world’s most valuable company might manage to ship at least one of its two major mobile operating systems on time. Update, Wednesday, Sept. 16, 1:45 p.m.: Folks on Twitter are reporting that they’ve been able to work around the problem by plugging their devices into their computers and downloading the software update via iTunes. If it had simply said that from the start, Apple would have saved its users some frustration and itself some embarrassment. It would have conveyed the message that this was not a bug but simply a delay in the software’s availability and that users should wait patiently. That would not be an unreasonable request, given the incredible number of people around the world who were all trying to download the same thing at the same time. Instead, the original “software update failed” notice conveyed the impression that something had gone awry, without any promise that it would be fixed soon. It also gave users two options—“close” and “settings”—that, awkwardly, both led to the same place, which was nowhere. The good news for impatient types is that at least some users who initially got the error message, including me, are now able to download the update directly to their devices without issue.